The look on her face!! The look on her face really is beautiful and sweet. Edited by Luciana, 25 May 2011 - 02:05 AM. ^ Thanks for posting, I haven't seen that before. Is it new? Yes!! They are beautiful together!! As HUGE a shipper as I am of course of R/Hr, I have to say the hug we see Hermione give Harry in the trailer, breaks my heart to see her saying goodbye to her "brother" as he goes to meet his destiny possibly? Ummmm... somebody seems to be on the outside looking in here. 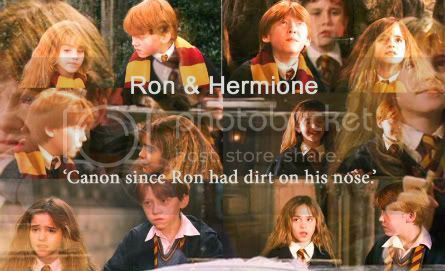 There is NO DOUBT that is was Ron and Hermione all the way. Who's her comfort when she needs it most? The only time Hermione EVER turned to Harry for comfort was when things were tough with Ron and she did so to find someone who would console her when she was frustrated with the man she loved, not to seek another man. Edited by Mr. Pumpkinhead, 29 December 2012 - 04:06 AM. Thats all I can say to that Jon!!!! I agree 100%...people just need to honestly see Ron was Hermione's only love-the love of her life, really since 2nd year. When the young girl decided to hug Harry there in CoS at the end, that was because he is her brother-her lil brother who was worried about her. 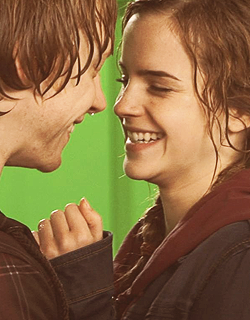 Ron too was worried about her but in a different way that said uhm I am having these different feelings for you. 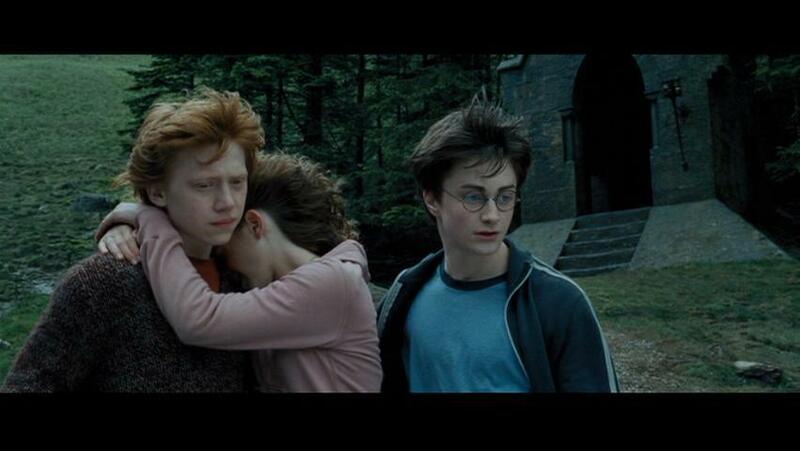 In the 3rd year, when Hermione goes to RON, not Harry, she def turns to her ginger knight for comfort. She could have gone to Harry but she needed Ron that very moment. Why? Because she was falling for him. Ron is the one who is ALWAYS there for Hermione-ALWAYS I mean look at DH 1-book and movie version...who was screaming her name in AGONY-RON...who told him to stop? HARRY-I mean I know Harry was concerned for Hermione and all but it was like Harry was the general saying there are casualties and we may have to lose one to get out of here. Would Harry have been devastated had Hermione died in the Manor? YES. Would he have felt he lost a part of himself? NO-Ron would have though. Also watch in the movie, when Ron says "like hell" running to Hermione, Harry sticks his hand out to stop him JUST as Bellatrix was ready to either use crucio some more or kill her Ron has is always will be Hermione's knight in shining armor. They love each other more than life-case in point that kiss in the chamber SCREAMED I cant lose you. Edited by Esmeralda**, 06 August 2013 - 09:47 AM. Going through this old thread and seeing some people do this, I completely agree.